The great earthquake and fire of 1906 demolished both San Francisco's Hall of Justice and City Hall, where the civil courts were located. 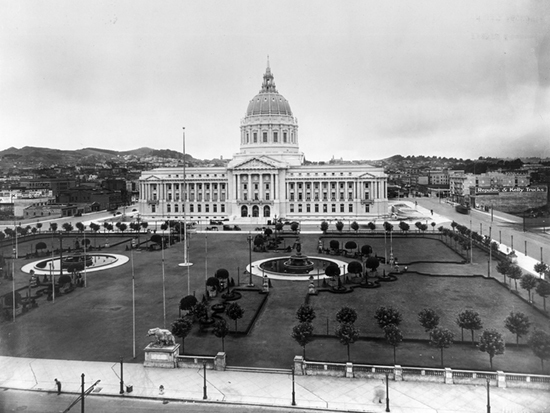 A new Hall of Justice was completed on Portsmouth Square near Chinatown in 1911, while the civil courts returned to the new City Hall, now part of a grand Civic Center complex, in 1916. The monumental beaux-arts structure was damaged in the Loma Prieta earthquake of 1989 and closed for retrofitting. The civil courts returned to the newly built Civic Center Courthouse adjacent to City Hall in December 1997. City Hall was completed in late 1998 and reopened to the public in January 1999. The Civic Center is listed on the National Register of Historic Places.